Discussion in 'POTW Collaboration' started by Serebii, Nov 4, 2018. It's the original Mythical Pokémon, Mew! Anyway, Mew has an infinite possibilities, as it can learn all TMs and Tutors. But listing them would be too long. Mew, the genesis pokémon. It is said that all Pokémon are descended from Mew. If so, than how is Mew related to Arceus (God), Dialga/Palkia (creators of Time and Space?) and manmade Pokémon like Porygon? Anyways, I degress, Mew is an incredibly versatile pokémon and can pull off almost any set to some degree of success. Mewnium Z is one of Mew's greatest tricks. A one time nuke that also grants the powerful Psychic terrain, boosting Mew's STAB to ridiculous levels as well as protecting Mew from priority like Sucker Punch. Standard Nasty Plot sweeper otherwise. Last coverage move is up to preference. Mew, the genesis pokémon. 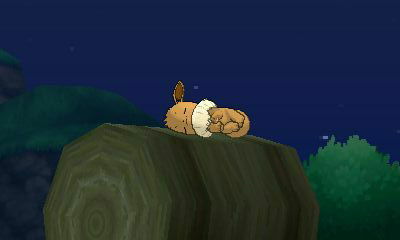 It is said that all Pokémon are descended from Mew. If so, than how is Mew related to Arceus (God), Dialga/Palkia (creators of Time and Space?) and manmade Pokémon like Porygon? Umm...I guess Arceus is God and Mew is Jesus? I honestly have no idea. Almost sounds like the Pokemon equivalent of the chicken and the egg question. Umm...I guess Arceus is God and Mew is Jesus? I honestly have no idea. If you are going on that route, then i would say that Mew would either be 'Adam/Eve'. 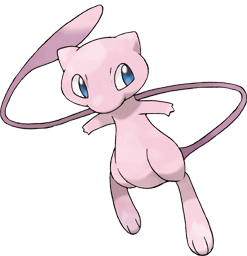 Mew is popularly known as The Phantom Pokemon for it's illusive mysterious nature throughout the series and is quite a fitting title as Mew is still one of the few event legendaries that is actually really hard to get as of USUM which unleashed legendary mayhem to the public, at least until Let's Go's take on the Mew Event. It's less popular but actual Pokemon category title however is The New Species Pokemon. 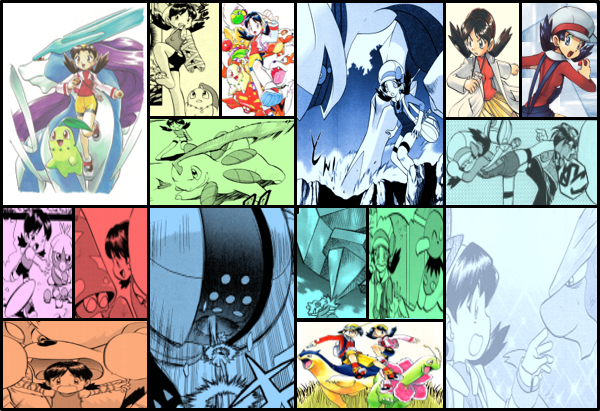 It's category title comes partly from the fact that at one time, it was a secret Pokemon even unknown to Nintendo at the time. By the time magazines revealed this, people assumed Mew was at the out-of-bounds truck at Vermillion City. According to it's Pokedex Entry, Mew is made up of the genetic composition of all Pokemon, a myth-turned-fact that's explored in Pokemon Adventures Emerald Arc when the soil of Mew's birthplace, Faraway Island, is used to calm almost all 386 Pokemon (the total of Pokemon up to Gen 3). One of Mew's most impactful roles is easily the very first chapter of Pokemon Adventures, where Red naively challenges the cute but absurdly strong legendary only for his very first Pokemon to get one-shotted, giving Red a harsh realization that he still has a lot to learn about Pokemon. However it's most famous debut started in Mewtwo Strikes Back where it battled it's cloned counterpart, Mewtwo, near the end of the movie. Anyways, enough about the background behind Mew. As the name implies, this set intend to use the full force of what Mew has to offer or pass on it's power to it's descendants, the other Pokemon Team Members. Mewnium Z is a massive upgrade to a Pokemon that has been getting powercreeped by more and more legendaries that have mastered specific areas turning Mew into a Jack-of-all-trades but master of none. Essentially Mewnium Z is both an offensive and a setup move, delivering a 180-STAB attack against any non-Dark type while also setting up Psychic terrain which protects Mew from priority moves and gives Mew a massive boost in it's Psychic moves. For coverage, one may want to consider Ice Beam against common Dragon threas, Ancient Power on Volcarona or Flamethrower against common steel and bug-types. Rock Polish to increase Mew's sweeping potential through it's speed, allowing it to outpace other potential sweepers like Garchomp or Greninja. Some other moves that people may want to consider, due to the potential of how predictable Mewnium Z can be, is the old fashion Nasty Plot-Rock Polish-and-Baton Pass combo. With the Mewnium buff, this makes Mew a lot more intimidating but also somewhat predictable. Using this intimidation, one could bluff the opponent who might switch into a Dark-type for a Nasty-Plot or Rock-Polish and baton pass to a different Pokemon. Again, the problem with Mew sets in general is four move-slot syndrome as you have to decide between coverage moves and sweeper-setup potential. Here's a Doubles set for Mew. Mew mainly wants to transform into its partner in Doubles, especially those that have stats boosts. Fake Out gives its partner some momentum to work around with by making one of its foes flinch. Tailwind for speed control, and Ice Beam those are weak to Ice such as Landorus and Zygarde if it hasn't transformed yet. If it's a Trick Room team, Tailwind can be replaced by Trick Room, give it a speed reducing nature, and tweaking its speed EV for something else. Aguav Berry is for emergency recovery in a pinch, most Pokemon don't run a special defense reducing nature in Doubles so that a transformed Mew won't be confused after consuming it. Remember that Fake Out is fairly difficult to get on Mew, it's from XD, so you can't get it on modern Mew. That said, Fake Out is popular on Mew in Special Rating season 13 (doubles, only legendaries, mythicals, and UBs allowed). Normalium Z is also used on that set at times for Z-Transform so that Mew heals upon transformation. It's not particularly fast and open to quite some damage on that second turn from the likes of Xerneas so having that healing when transforming is nice. Also, I don't think the nature is changed when transforming, Mew only copies stats (excluding hitpoints), typing, ability (to an extent, form-changing abilities don't function), stat changes, and form. It doesn't copy stuff beneath that like EVs, IVs, or nature. It just copies the stats itself.